Top Victorian trainer Andy Gath has revealed his star Australian pacer Tornado Valley is being aimed at New Zealand Cup week. All the talk has been about Chicago Bull, but it would appear that Tornado Valley is also being aimed at the New Zealand riches after returning to work. Tornado Valley had an amazing debut campaign when picking up 10 wins, including one at Group 1 level and three at Group 3, a second and a third from just 14 starts. We've had NZ in mind for quite a while because he's from there and the money is good for those races. Gath thinks the spell will have done him the world of good and is now looking forward to see him making his return, with a couple of races on the cards at Addington this week. "We liked him as soon as we got him, but he still surprised us how well he handled every new challenge we asked of him,"
Gath said. "It's good to have been able to give him that break ahead of all the big race at the end of the year." 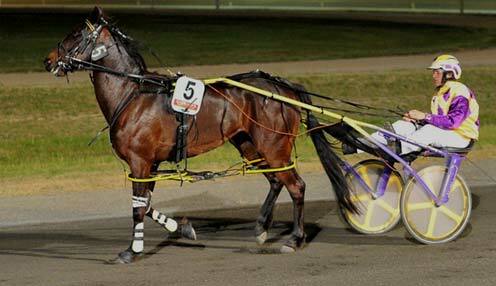 Tornado Valley's meteoric rise through the ranks saw him sit alongside Australia's best trotters when he was spelled after a third at Melton on 21st July. "His first big target is the Bill Collins Mile on Victoria Cup night (October 13)," Gath said. "Then it's over to NZ all going well. We've had NZ in mind for quite a while because he's from there and the money is good for those races. "He showed last time in work he could match it with the best."